As a young boy, my mother taught me the prayer and novena to St. Jude and encouraged me to pray to him in both good and bad times. I hope you'll find this to be a very good read about St. Jude, most especially for children. 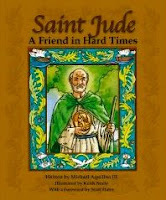 Twelve-year old Michael Aquilina III wrote Saint Jude: A Friend in Hard Times in 2004 (published by Pauline Books & Media). From the forward of the book by Dr. Scott Hahn, Founder, President and Chairman of the Board of The St. Paul Center for Biblical Theology: "The first time Michael Aquilina III visited my home, he must have been nine years old. He came to play with my sons, Jeremiah and Joseph, but he detoured through my book-lined office. He looked up at the rows of towering shelves and turned to me without hesitation, saying: "You should write a book about Saint Jude." It wasn't a request; it was a statement. And he repeated it on several other visits. As a father of six, I've learned to be open to the Holy Spirit speaking through the mouths of children. I knew, however, that a book on Saint Jude was not in my near future, as I was already under contract to write several other books. So I told Michael:"I think God has placed that wish in your heart so that you might write the book." That was the last I heard of the Saint Jude book - until, years later, when I received Michael's finished manuscript in my mailbox, along with a gracious invitation to write some words of introduction. I'm pleased to comply. Since I became a Catholic in 1986, I've had a great fondness for Saint Jude. Early in my studies, I discovered that I was born on Jude's feast day, October 28, in 1957. For that reason - and because I've always been a sort of "lost cause" - I believe this Apostle has watched over me with great care. Like Michael Aquilina, I hope that many, many people will come to know Saint Jude's watchful care and his mighty prayer before the throne of God. The last book of the Bible, the Book of Revelation, shows us twice that Saint Jude holds a prominent place in heaven. God has blessed Jude as an Apostle, and so his name is on one of the twelve foundation stones of the heavenly Jerusalem (see Rev 21:18). As a martyr, too, Jude raises a powerful prayer, fully aware of what is happening in our lives on earth (see Rev 6:9-10). Even now, Saint Jude is very much with us, in that "great cloud of witnesses" (Heb 12:1), the communion of saints. Michael Aquilina has written a book I could not have written, even though I am a teacher of theology. For every book of devotion is a special grace from God. My own books are God's gifts to me and my readers; this book is God's gift to Michael and his readers, among whom I am proud to be the first. Read on, then, and walk the roads of life with Saint Jude. May the Apostle lead you without delay to share in the friendship and close family bond that he himself shared with Jesus." From the blog of Maureen Wittmann, who wrote the following article on how a 12-year-old, home-schooled boy came to write and publish this book: "St. Jude: A Friend in Hard Times, recently released by Pauline Books and Media, is a gem. Illustrator Keith Neely’s artwork is beautiful enough to turn this children’s book into a coffee table book. However, you wouldn’t want to leave it on your table for too long, as it is a terrific read. The historical information is interesting and the storytelling engaging. I don’t think that there is an historical account so easily accessible for children anywhere. Additionally, author Michael Aquilina III was able to bring St. Jude to life for my family. I want the saints to be real for my children, not just pictures on prayer cards, and this book accomplishes that end very well. The amazing thing about all this is that Michael wrote St. Jude: A Friend in Need when he was just twelve-years old. It all started when Michael, at the ripe old age of seven, became fascinated with computers and read their manuals just for fun. One day, Michael had a computer problem that he could not fix himself. Nor could he find a solution in his beloved computer manuals. So he prayed for St. Jude’s help. In no time, the computer problem was resolved and Michael found a new friend in St. Jude, patron of desperate causes. It wasn’t long after that Michael’s grandmother suffered a stroke. Michael and his father stayed with her for a week to help out. With a simple reminder from his father of Dr. Hahn’s words, Michael began writing his book during this out-of-town visit. In just one week he wrote the bulk of St. Jude, with the occasional writing tip from his father, Catholic author Mike Aquilina. Now, not every child has a prominent author for a father or has the opportunity to hang out in the homes of other prominent authors. However, it was not these things that led to Michael’s writing of St. Jude. I submit that Michael has been able to achieve the extraordinary because he has parents who support and nourish his interests, from his fascination with computers to his love for St. Jude. Most importantly, he has parents who live the Church’s teaching of parents as primary educators. As home educators, the Aquilinas have taken on the academic instruction of their six children firsthand. Most parents do not choose homeschooling, but that does not mean that they don’t have a significant influence on their children’s academic success. A parent’s attitude toward education can spell either academic success or failure, and creating an atmosphere of learning in the home can make all the difference in the world. The Aquilinas do this in ways that can be imitated by any parent. They let their children see them reading all of the time. They make time to read to their children. If you don’t like to read aloud, turn the tables and ask your child to read to you. In this way, you not only encourage learning, but also spend quality time with one another building bonds that will not easily break. Also let your child see you write. Of course Michael sees his father writing all of the time as that is Mike’s fulltime job, but he also sees his mother Terri writing letters to friends, letters to the editor, and journal entries. In this way, the Aquilina children think that this is what people do and therefore they do it themselves. Writing skills can blossom when practiced outside of the classroom and applied to everyday activities. In order to achieve academic success, children need good writing skills. It is not enough to read, children need to be able to communicate the knowledge that they have accumulated onto the written page, especially if college is desired in their future. So write and write often. One area that most of us do not think about is the worth of doing research. Let your children see you research a lot. Before you write that letter to the editor get on the Internet or go to the library to make sure that you have your facts straight. If the Aquilinas have a child ask a question that they cannot respond to honestly, they search for the answer. Pulling down your Bible, Catechism, or encyclopedia from your bookshelf will speak volumes to your child. In preparing his book for publication, Michael had to do a lot of research. On more than one occasion, Michael’s editor at Pauline, Sr. Patricia Edward, had to ask Michael to give some background in Catholic doctrine, for example, on the intercession of the saints. Pauline also had scholars review the book who suggested that Michael be clearer in other areas. He had to point out where historians disagree on certain details of St. Jude’s life story. Had Michael’s parents not set a good example for him in doing their own research, Michael may not have been able to complete his book satisfactorily. Just as children need to learn to communicate through writing, they need to learn to articulate their book knowledge through the spoken word. The Aquilinas suggest making many friends to cultivate the art of conversation. Invite your pastor, coworkers, and other interesting people to your dinner table. Go deep in conversation with your guests and include the children. Pray to your guardian angel and the guardian angels of your friends, and ask them to help guide your conversations and your correspondence. Let your conversations meander and don’t be afraid of silent moments. Michael Aquilina III is very comfortable in the company of adults. I once saw him at a Catholic education conference where his father was a speaker. As his father answered questions, Michael was engaging in a conversation with several academics from a Catholic university and he did not look out of place at all. This has a lot to do with the fact that Michael and his siblings are always welcomed to listen in on their parent’s conversations. If the children interject more than their parents desire, you would never know it. To sit in the Aquilina living room is to be surrounded by lively conversation with everyone participating. Children are never talked down to or asked to shush. The art of conversation and the development of the intellect are also encouraged by the fact that the Aquilinas limit television viewing almost to the point of extinction. Yes, there are good programs on television, but even good television can be abused. It is much easier to encourage reading, writing, researching, and conversation, if your home is void of television noise. Besides, too much television makes for passive children with high needs for sensory stimulation and that is the death of the intellect. While it is important to “teach” our children religion, most of what they learn is through modeling. We can sing the praises of Mother Church all day long, but if we ourselves do not truly love God and His Church then we cannot expect our children to love them. When Terri Aquilina prays her rosary, her children naturally join her. When she attends Mass, goes to confession, prays before meals, her children want to participate with her. If parents show an interest in something then children, particularly young children, will also show an interest. Conversely, children will not find value in things that parents don’t care to do themselves. Now as children grow older and they begin to question their religion, parents need to be prepared with answers. Prayerfully, your children are receiving a good education in religion through their parish school, CCD, or homeschool program, but that is not enough. Children, teens in particular, are sure to eventually ask: Why do we have to attend CCD? Or go to Mass? Or pray the family rosary? They need to hear from their parents why these things are important to them as Catholics. Don’t be afraid to be a herald of the Faith to your children. Speak of God not only on Sunday, but everyday. In a society where we have separation of church and state, we sometimes forget that it is okay to speak of God in normal conversation. Sometimes we even forget that it is okay to have a religious opinion in the public square. You can be a herald of the Faith simply by voicing your opinion as a Catholic when neighbor or family member makes a statement that is contrary to your beliefs. Doing this, in a charitable manner of course, will teach your children the importance of faith matters. For example, the Aquilina children know intrinsically the Church’s stance on human life. This is because they have a mother who will not hesitate to picket the local Planned Parenthood office or write a letter to the editor. They have a father who will not hesitate to speak up when the topic comes up in conversation with a friend. It is in this way that the children absorb Church teaching in a very natural way. When I asked Michael, now fourteen-years old, if he found himself adopting his parent’s values, he answered quite simple, “Usually.” Yes, children have free will and they are sure to develop their own opinions and values, but the foundation upon which those values are built largely depends on the involvement, or lack of involvement, of parents. Michael has always enjoyed hanging around his father’s home office. Once, when Michael was about eight-years old, his father Mike was working as a newspaper reporter and he was interviewing a rather famous sociologist of religion who was an agnostic. The man told Mike, in the course of the interview, that he would very much like to have faith, but he couldn’t quite bring himself there. Michael was sitting in the room, reading. After Mike got off the phone, he asked Michael to pray for the man’s conversion. Michael asked if the man prayed for faith. His father told him that he didn’t know and as a journalist he didn’t think it was his place to ask that question. Michael told him it was his Christian obligation to do so. So Mike contacted the man again. If we parents do our best to take on the role of primary educator, we will find ourselves in turn learning from our children, and sometimes in ways that we never imagined. As parents we all fail, sometimes daily. The Aquilinas are no exception; Mike and Terri are the first to admit that. It is an incredible responsibility to raise godly children, but we have a saint in our midst to help us when things seem hopeless. In his epistle, the second to last book in the Bible, St. Jude reminds us that we should persevere in harsh and difficult situations. Do not hesitate to seek St. Jude’s intercession. He sat with our Lord at the Last Supper, he performed miracles in the name of Jesus, he spread the Faith throughout the world as one of the first Christian missionaries, and he wants to help us persevere in our God-given roles as parents. The Catechism of the Catholic Church (paragraphs 2221 to 2231) expresses in beautiful terms the teaching of parents as primary educators of their children. It tells us that we are responsible for the formation of our children’s souls in addition to their intellect. It is through the application of this teaching that the biographer of St. Jude was nurtured." You can order the book from Amazon.com. This blog receives no commission from a purchase of the book through the previous link.